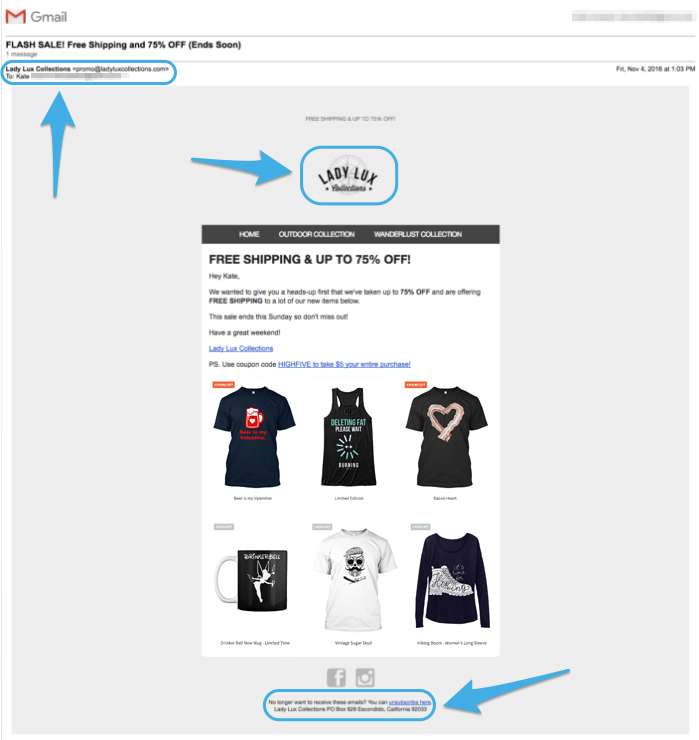 Now that you’re able to access your buyer emails through Teespring you’ve got an amazing opportunity to generate more sales using email marketing! As we’ve previously mentioned, email marketing is the best example of “permission marketing,” which means people can opt in and out of their relationship with your brand as they please. Essentially it is their choice if they want to be contacted by you; this is why the buyer emails available to you are people who have previously opted in to receive further communication from you. As you proceed with contacting your buyers it’s important for you to be aware of the legalities of email marketing; most importantly anti-spam legislation that applies to commercial electronic messages. Remember, the relationship you build with your email list should be consensual; below you’ll find some tips on the best ways you can comply with these laws. NOTE: If you choose to neglect these laws, you could run into some serious fines if someone decides to build a case against you—which can cost you thousands of dollars—depending on the country you’re marketing to (not just the country you’re emailing from). Depending on which country you’re marketing to, anti-spam laws may differ. Here are some simple “best practices” to follow to help you comply with laws and keep your buyers happy. Get consent: You can go ahead and check this one off your list! We’ve obtained consent for you; starting in May 2016 we began offering buyers the option to opt-in to marketing emails and share their contact information. This is why you’re able to download buyer emails from May onwards. Clearly identify yourself: The buyer who receives your emails should be able to instantly identify who you are; this means including your brand logo and/or brand name associated with their purchase. Also be sure to include a physical address or website in the footer of your email. Always offer a way to opt-out of emails: This is extremely important! Every email you send to buyers needs to provide a way to unsubscribe. Remember email marketing is “permission marketing” so they have to have the option to remove themselves from all future communication if they want. Let’s take a look at the marketing email below as an example. What are some important elements they’ve used to comply with anti-spam laws? Clear identification through email address associated with their brand: At the top of the email we can see the email is from “Lady Lux Collections” and the email includes the brand name “promo@ladyluxcollections.com”; creating an email address featuring your brand name is a good way to let buyers know who you are. Clear identification through brand logo at top of email: At the top of the email we can easily see the brand logo—we know exactly who is contacting us. Marketing opt-out through unsubscribe option in footer of email: At the bottom of the email we can see the message “No longer want to receive these emails? You can unsubscribe here.” It’s very important for you to include a similar message with an unsubscribe link in your emails to buyers! Clear identification through physical address in footer of email: Below the unsubscribe link there’s also a physical address provided which indicates the seller/brand owner is located in California. Learn more about email marketing in the Training Center and Teespring Blog.